"From my great-grandmother's recipe file." Beat egg whites with a dash of salt until foamy. Gradually add sugar, beating well, then beat until stiff peaks form. Beat in vanilla and vinegar. 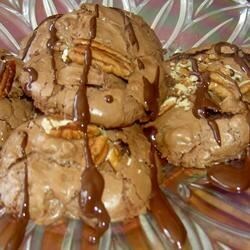 Fold in melted chocolate and nuts. Drop by teaspoonfuls on well greased cookie sheet. Bake at 350 degrees F (180 degrees C) for 10+ minutes. Remove from pan *immediately*. Decorate with nuts if desired. Ok, not great...really sweet and I even cut the sugar to 1/3 cup. Thanks anyway, though. Heavenly!! I love the flat shape and texture of these, crispy on the outside, soft and chewy on the inside. Wonderful recipe! picked this recipe because it shares the same name as my children's school.this will be are weekend treat. WOW! Wonderful cookies...everyone I have shared them with raved. Their texture is kinda chewy on the inside and a little crunchy on the outside. So tasty! These cookies were a disappointment. They taste OK, but they were runny and they all spread together. I thoroughly greased the pan, but I had to resort to scraping the cookies off with a fork.